November deals: top 10 sparklers | What Car? We havent uncovered a gunpowder plot, but our deal finders have revealed 100 new deals this week saving car buyers a total of 377,184. 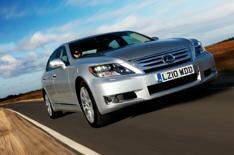 You'll still need deep pockets to buy a Lexus LS from Coasttocoastcars.co.uk, but a 10,000 discount is not to be sniffed at. Price you pay: 82,289. Need a big MPV? Better get one with a big discount, then. You can get a Renault Grand Espace 2.0 dCi 175 Dynamique Nav for 22,544 that's 7156 less than list price. Find out more at Carfile.net. Carfile.net knocks nearly 20% off a Vauxhall Astra 1.4T Elite five-door. Price you pay: 16,929. Citroen's quirky C3 Picasso not quite to your taste? It might well be now that Lowpricecars.co.uk is offering a 1.6 HDi 90 VTR Plus for 11,250 3645 less than list price. With a new model coming early next year, now could be the time to haggle hard on a Ford Focus. Drivethedeal.com will sell you a 1.6 TDCi 109 DPF Style five door for 13,021 3474 less than list price. There's a new 'Golf-with-a-boot' on its way, which is why you can get more than three grand off a VW Jetta 2.0 TDI 140 SE at Drivethedeal.com. Price you pay: 17,146. The clocks have gone back, so what better time to enjoy drop-top driving? Well, when the prices are as good as this for a BMW 3 Series Convertible you could be converted. Coasttocoastcars.co.uk will sell you a 320i SE Convertible for 30,064 that's 2848 off the list price. The supreme estate car? Well, you decide, but that decision could be made sweeter with a discount of nearly 3000 from Autobytel.co.uk. It will sell you a Mercedes E220 CDI SE Estate for 28,181. The Volvo C30 might well have a starring role in the Twilight movies, but you won't pay Hollywood prices at Drivethedeal.com for a 1.6 Drive SE Lux version. It will sell you one for 18,372. This isn't the biggest discount we've seen, but the 900 off a Hyundai i20 1.4 Comfort that Mkhyundai.co.uk is offering brings the price satisfyingly below the 10,000 mark. It's yours for 9950. Deals are valid until 09/11/2010.